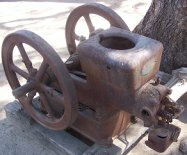 In the late 1800s, steam and gasoline engines were large and required extensive maintenance. This 1916, 3-horse-power engine is smaller, lighter, less-expensive to operate than previous models. In the 1890s, Fairbanks-Morse was the first company to successfully market gasoline engines in the United States. The company is still operating today. 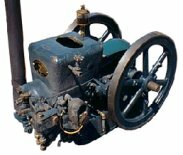 Initially steam and gasoline engines operated stationary equipment. The end of horse drawn farming equipment began with the invention of the steam traction engine (later shortened to "tractor") in the late 1800's. However, these were large and required extensive maintenance. Introduced about 1910, the less expensive, lighter, and faster-starting internal combustion tractors replaced the steam engine by the mid-1920s. By the 1930s the horse was almost completely replaced by gasoline tractors. Pictured above is a 3 horse power 1916 Fairbanks-Morse "Z" gasoline engine. The engine pictured left is a fully restored example. This early 465 lb (211 kg) 3 HP typifies the very popular "Z " models that were built from 1915 clear into the late 1940s. These engines ranged from 1 1/2 to 20 HP in a very large variety of styles and applications. The acquisition of the Eclipse Windmill Co. and the Williams Engine Works in 1885 was the start of Fairbanks Morse Engine. Fairbanks-Morse started building gasoline engines around 1893 and was the first company to successfully market a gasoline engine in the United States. For over 100 years they have built engines for anything from farms to today's modern U.S. Navy. Today, Fairbanks-Morse continues to operate as a division of Colt Industries.